Jarrettsville Nurseries at Holy Cross Rd is a family owned and operated Christmas tree farm started by Charles St. Clair in 1961 when he planted trees on a small parcel of land in the Jarrettsville area as way to earn money to put his children through college. In 1980, Charles and his new bride, Eleanor Saulsbury St. Clair, bought part of his family's farm land on Holy Cross Rd. 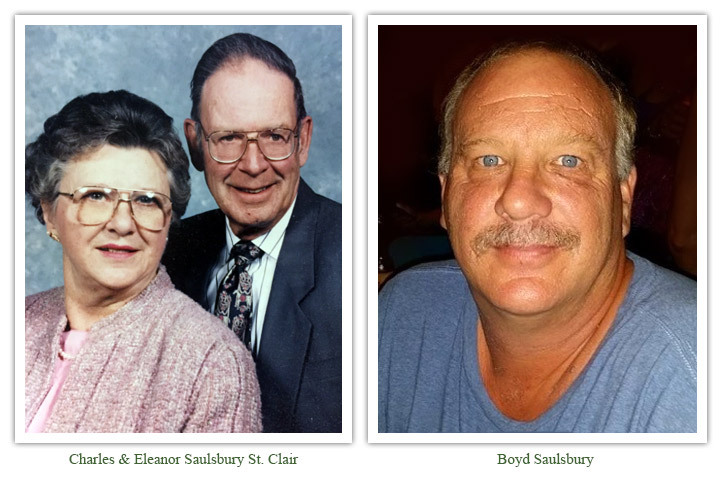 Although all their children worked on the farm at one time or another, it was after Eleanor's passing in spring of 2002 that their son, Boyd Saulsbury, began managing the day to day operations of the farm with his wife, Dana, joining in his efforts a couple years later. Charles St. Clair passed away in spring of 2011, just a few months shy of celebrating 50 years in the Christmas tree business. His vision and leadership helped build Jarrettsville Nurseries into the largest Christmas tree farm in Maryland. Before his passing, Charles got to mentor the next generation on the farm, his grandsons! Starting off cleaning up pine needles around the shaker and baler pits, Tommy and Brandon worked their way up to driving the tractors that tour the customers around the farm. They had become their dad's right hand man, learning from their father as he had before them. Sadly Boyd passed away in early 2016 after a year long battle with cancer. His passion and love for the farm created the perfect Christmas tree experience. His favorite part of the season was talking to customers who used to come to the farm as a child but now come to farm with their own children. He put other families' Christmas before his own. Wanting to continue the family's legacy, Dana bought the business and most of the farm land that it operates on in 2016. 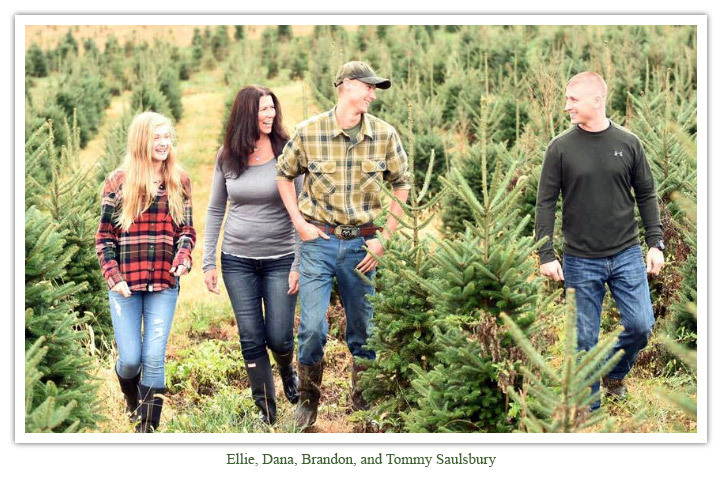 Dana and her children celebrate Jarrettsville Nurseries' 57 years in the Christmas tree business this year. The family will continue to strive to bring their customers the perfect Christmas experience built on the love, vision, and passion of those who cared so deeply about this farm. Jarrettsville Nurseries belongs to the Maryland Christmas Tree Association and the National Christmas Tree Association. 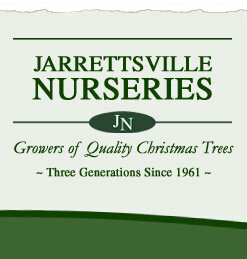 Jarrettsville Nurseries was one of the first members of the Maryland Christmas Tree Association (MCTA) and has served as a host and coordinator for MCTA conferences. Jarrettsville Nurseries is proud to be a part of the Harford County community. Whether it's a local bingo, golf tournament, PTA, library or hospital, Jarrettsville Nurseries believes in neighbors helping neighbors. We are honored to be able to spread a little Christmas joy all year long and recognize that we couldn't do it without you. Thank you for choosing us to be the start of your Christmas and taking a little piece of us home! Jarrettsville Nurseries is located in the rolling hills of northern Harford County close to the Pennsylvania line. In the winter, this valley is perhaps one of the coldest spots in Harford County which assists in our successful growing of Fraser fir. Deer Creek, a major tributary of the Susquehanna River, runs through our farm and helps to provide the necessary moisture for crop growth. It is our desire to retain our property as agricultural land and to continue the landscape of a rural environment. When you visit us, you will enjoy the scenery of our location and the beauty of Deer Creek Valley. Come see why our trees continue to win awards year after year; including Grand Champion at the Mason Dixon Fair for 10 years in a row and several 1st place and Grand Champions at the Maryland State Fair.